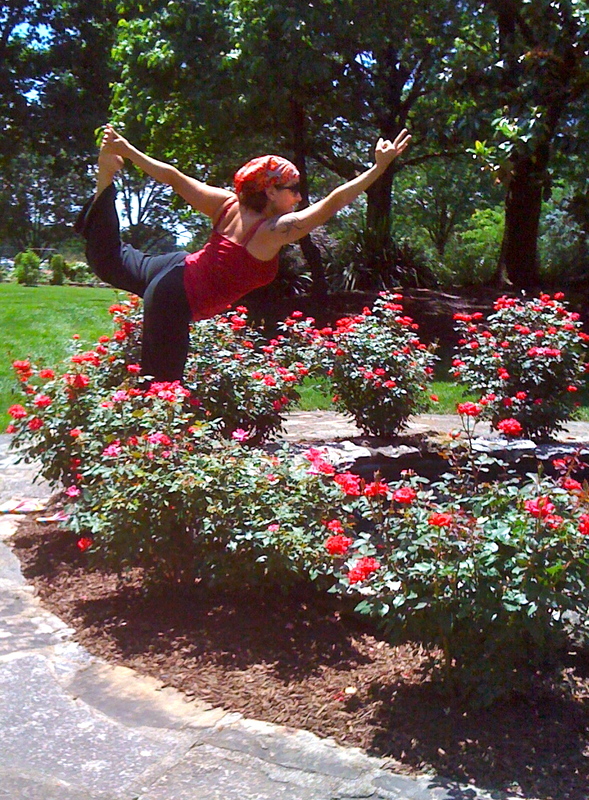 Today I am preparing to teach a private outdoor yoga session with a long time student. We’re meeting tomorrow and I’m very excited about it! It will be the first time she has done yoga outside (my favorite place to practice,) and I don’t believe she’s ever had a private yoga session before, either. I’m giddy with the joy of being able to bring these experiences to her. There is something amazing about practicing outside. You are in fresh air, feeling the sun on your skin, hearing birds, and feeling the earth beneath you (often when I practice outside, I skip the mat entirely.) It’s magical and the feeling of being one with the universe is undeniable. You can feel the energy from the earth come up through your hands and you can feel your own energy swirling around you like a spring breeze. I get all goosebumpy just thinking about it! Teaching private yoga sessions also thrills me. When I teach group classes, I do my best to get around to each student and lay my hands on them at least once to either adjust, assist, or affirm what they are doing. There is power in the human touch and I find it to be an incredible component of a good class and a good teacher, but let’s face it – there are days when I can just not get to everyone as often or as in as much detail as I feel might be beneficial. This is where the private session comes in. When I do a private session, I am almost all hands on. I might demonstrate something, but usually it’s my student on the mat (or on the ground,) and me actually teaching and explaining each move step by step and where the hands or feet or breath should be for that particular student to make the most of the asana and practice. I can focus my energy and my vision entirely on that particular student and, I believe, can make significant and lasting changes in that student’s practice. We might spend 10 solid minutes working on the proper alignment in Trikonasana, for example, so that the next time we meet, he or she will know exactly where to go and how to get there that particular day. In subsequent private sessions, we can move on to different things because we’ve already covered the basics. Of course, a student might approach me to do a private session based entirely on arm balances or releasing the tension in the lower back or whatever, but if that is not specified, you can bet I’m going to work on alignment. Regardless of what we are covering, however, my eyes are focused solely on my student. They get my undivided attention, it’s all about them. What a great gift to receive, an even greater gift to give! When you combine a private lesson in a public outdoor place, however, something even more incredible happens: the student really feels what it’s like to focus internally, to experience that moment when all that matters is what’s going on on her mat. I love teaching in a park. At first students get a little nervous about people walking around and watching. I admit, it can be a little intimidating, but it’s also wildly liberating! It doesn’t take long for the student to forget that people are around, to forget that they aren’t alone in their backyard, to forget that there is anything going on in the world other than their practice and that, my friends, is what yoga is all about! Just as arm balances and inversions almost always bolster confidence in a student, practicing in public also gives a boost! If you can practice Kapotasana in the public, you can wear that skirt or ask for a raise or say YES to whatever you’ve been on the fence about! I have never watched a student walk away from a private outdoor yoga session feeling anything less than accomplished, empowered, invigorated, and inspired. Is there any wonder why I love my job? Have you done yoga outside? Have you taken a private class? If so, what do you love about it? If not, why not? What is stopping you? Get out there, get your hands and feet in the grass, and let your eyes, all three of them, shine! Okay. I tried. I really really tried to publish this post without including this video, but I just couldn’t. So I’m sorry and you’re welcome. What’s green and black and white all over? #365yoga Day 10, baby! 10 days in already, wow! How are you feeling, Yogadorks? I decided it is finally time for me to do a little extra something for my insides. I eat fairly well, but know that I am not always getting the most vitamins as I could possibly be getting. I prefer to get my vitamins and minerals from food rather than a pill, and sometimes that gets a little complicated. So many yogis and yoginis I know are almost always talking about drinking green juice or green smoothies. I like juice! I like smoothies! 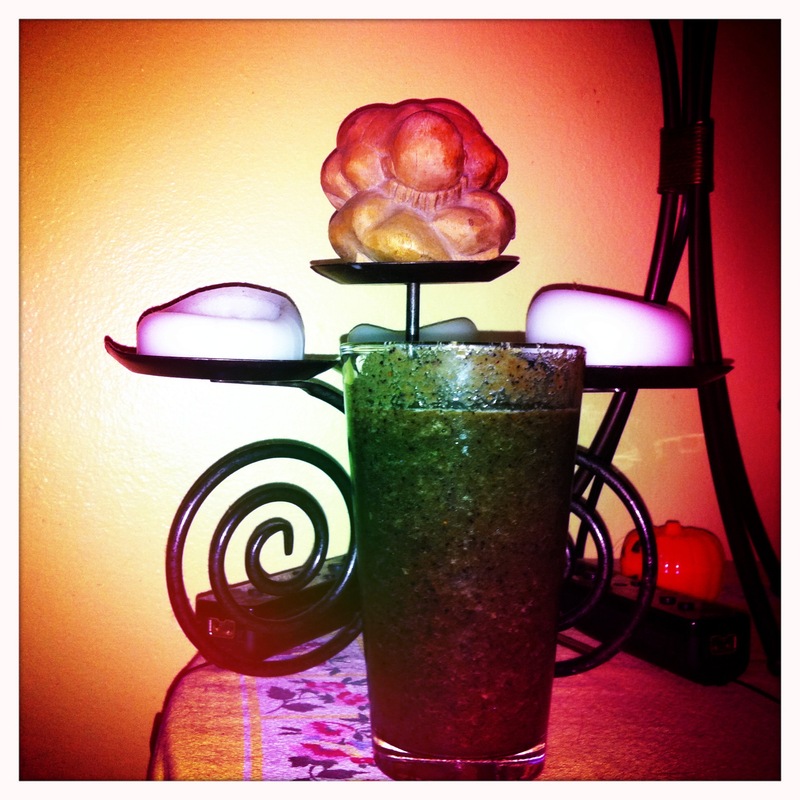 But, um….. do I like drinking my spinach? I had no idea. As I mentioned yesterday, I fought the insane pre-snowstorm grocery store and stocked my house. I made sure to get a lot of organic green veggies and some fruits and vowed that this morning would be my green juice debut. I got out my tired old blender, spoke sweet words of encouragement to her, and then packed her full of spinach, Granny Smith apples, a few blueberries, a strawberry or two, some ice, and a bit of water. I took a breath and hit liquify. I poured it into a glass and, admittedly, it didn’t exactly look like juice and it didn’t exactly look green, either. I should have let it blend longer and used more apple and less blueberry, but regardless, it was a smoothie made mostly from spinach. It was what it was …and what it was was DELICIOUS! I drank it down and honestly wanted to make another immediately. What can I say, moderation has never been my strong point. I resisted, but let me tell you, I’m certainly looking forward to breakfast! Not long after I finished my green drink, it started snowing. It’s been snowing now for about 6 hours and isn’t due to stop until tomorrow some time. We cancelled class at Yoga Sol, opting for safety and warmth and yoga at home. Well, scratch the warmth for me, I guess, because I decided to practice SNOWGA! Yes, yes, I did go out with my kids and my dog and did some yoga in a snowstorm. I cannot help myself! I also cannot help but bribe my kids to take pictures of me doing yoga in strange places (they got rewarded with massive mugs of hot chocolate) and I have found that nothing looks better than snow pictures in black and white. Tomorrow will be more, I’m sure. It’s fun, TRUST ME on this. Since much of the US is getting hit with the white stuff, why don’t you go out there and find out for yourself? Be a kid again! PLAY! Go upside down! Fall down! Roll around! Practice in the snow – it’ll warm you from the heart out. It doesn’t get much more yogic than that! It’s been beautiful weather here this week. We’ve gotten a break from the sweltering temperatures and the random pop up hurricanes (okay, we’re landlocked – not REALLY hurricanes, but I swear it’s similar,) and it’s been in the mid to upper 80s with beautiful blue skies. 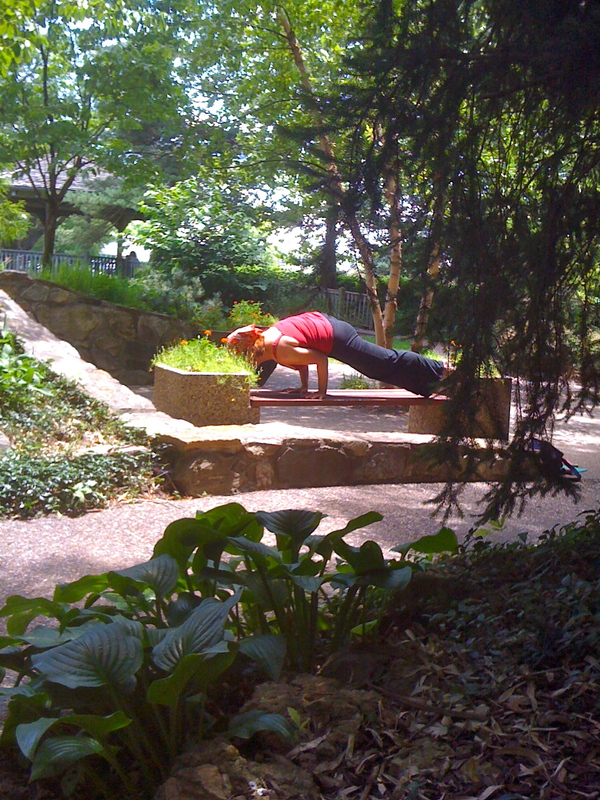 PERFECT weather for a picnic in the park — and some Random Acts of Yoga or PDA (Public Displays of Asana.) Yesterday, I was lucky enough to do just that with my kids. We have a gorgeous park here in town and we like to go as often as possible. It’s really more of a botanical garden. I love it. 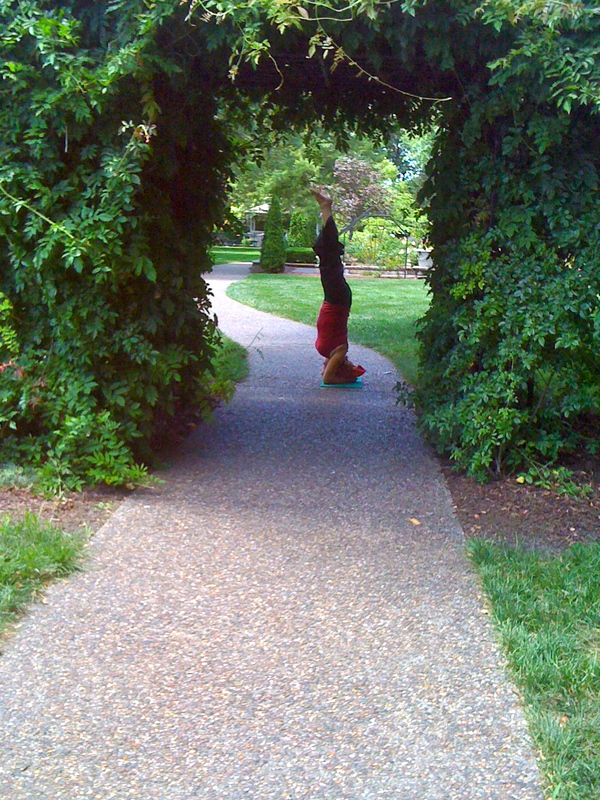 Shelter Gardens made the perfect setting for some yoga play. 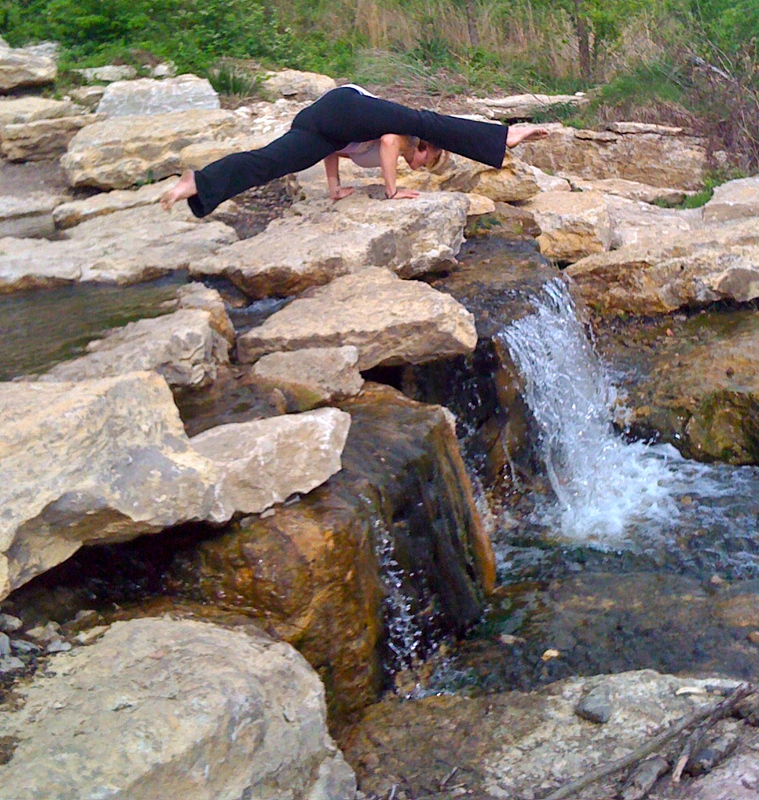 With a small piece of yoga mat cut from an old, dog eaten mat in hand and a 10 year old son will to take pictures, we headed out. Completely not the most flattering angle, but you can see nothing but hands on the ground! Getting into this pose was much easier than getting out - I was directly over water. Hands on one rock, feet on another, rapid flowing stream in between! 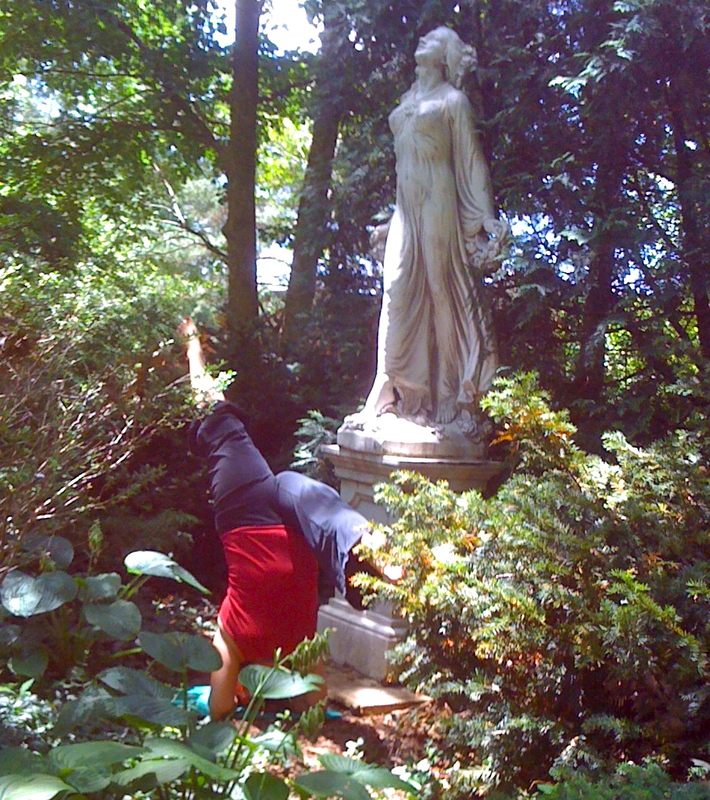 Again, I encourage you to get out and try some yoga in places you wouldn’t expect. There is a cosmic connection with the universe when you are making the yoga with nothing between the earth and your skin. It just feels SO good! Give it a try! 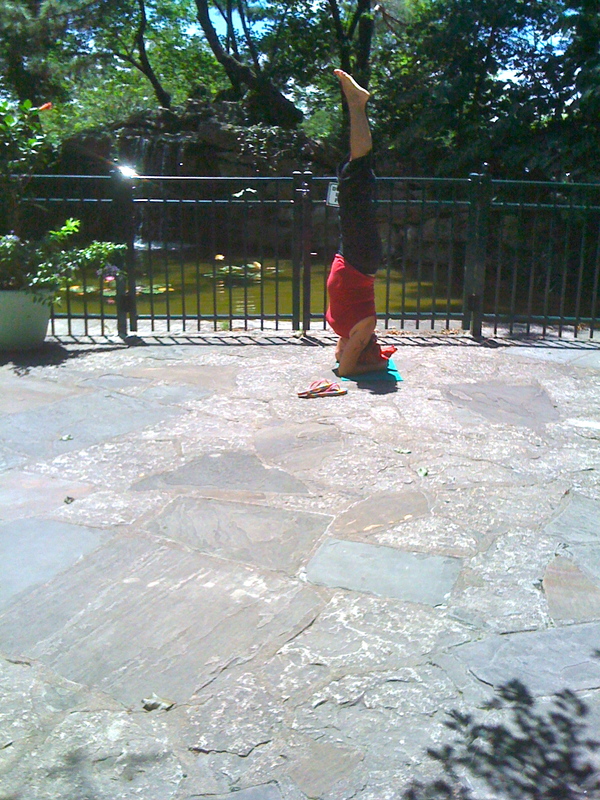 No, really, yoga IS everywhere! Occasionally, we just need to get out of Dodge. We don’t have to be gone for a long time, but, as a family, there are times when we need to see something other than our four walls. 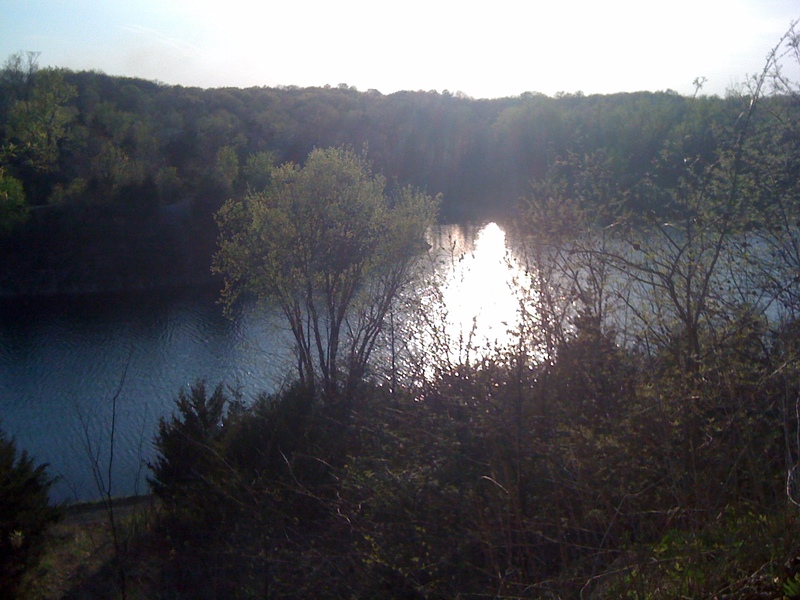 On those occasions, we frequently go to a state park nearby to camp and hike. We did this just last week. I usually find a place to do at least 1 round of Surya Namaskar (Sun salutation) in camp, but I also like to find out of the way places to connect to The Divine. Last week found me seated for meditation with this private view. Take a different approach to your practice. Find a new and interesting place to meditate. Find your yoga off the mat. 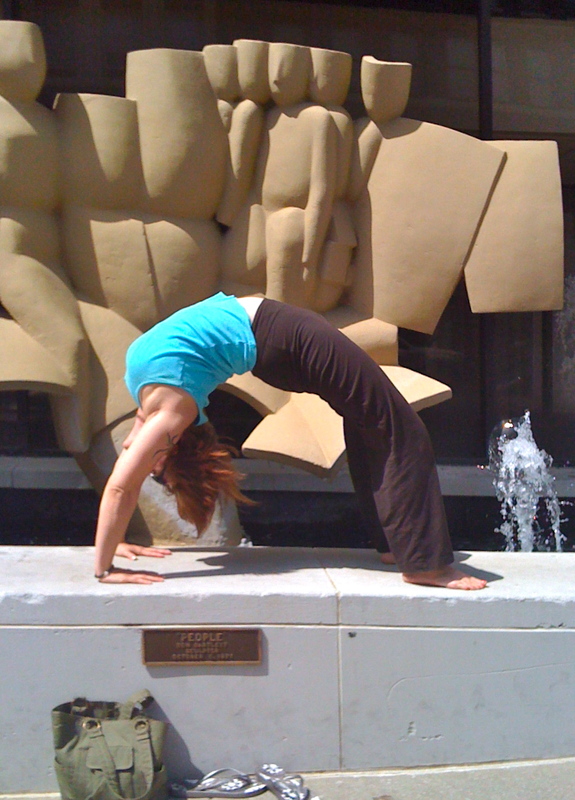 The Public Display of Asana, that is! I had reason to be tooling around downtown today while walking my oldest son to his yoga class, so we decided to play around and take some pics. Photographer is my 9yo with an iPhone, so you know, take what you can get!